In cold and wet climates, the sunroof may not work properly due to freezing conditions. After the vehicle is washed or in a rainstorm, be sure to wipe off any water that is on the sunroof before operating it. 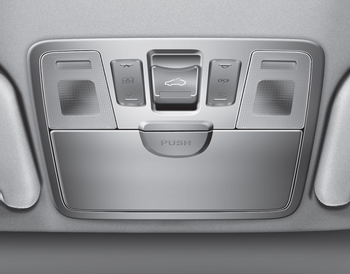 Do not continue to move the sunroof control lever after the sunroof is fully opened, closed, or tilted. Damage to the motor or system components could occur. In order to prevent accidental operation of the sunroof, especially by a child, do not let a child operate the sunroof. Do not sit on the top of the vehicle. It may cause vehicle damage.